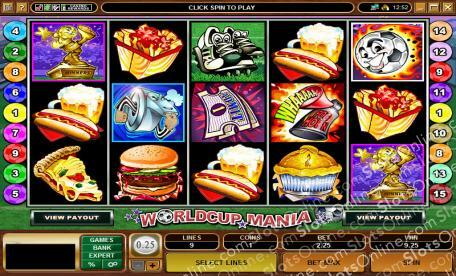 With football intensity about to hit fever pitch, it's time to get down to the slots to start winning some World Cup cash! Click here to play! Worldcup Mania is a great 5-reel slot played across 15 paylines of football madness. The Ball symbol is Wild and can be substituted for any other symbol on the reels except Scatters and Bonuses. If you manage to get 5 of them in one spin you will be rewarded with 7500 times your original wager! The Whistle is Scattered and also acts as a trigger for a Free Spins Bonus Game when three or more appear on the reels. Another Bonus Game can be activated when you earn three or more Trophy symbols; if you manage to achieve this you will find yourself in the Free Kick Bonus Round! The World Cup isn't far away now, so start playing Worldcup Mania today for some incredible cash payouts. The Whistle is Scattered. No only does it pay out when two or more are spun, it also triggers the Free Spins Bonus Game when three or more appear on the reels. The Football is Wild and will earn you up to 7500 times your initial wager, as well as substituting for any other symbol except Scatters and Trophies. Spin three or more Trophies and you will be sent straight to the lucractive Free Kicks Bonus Room!